Every restaurant has a story. Oak & Stone's begins with a guy who just wanted to watch the game with a cold beer and delicious food. Any self respecting Midwesterner knows that fall weekends are for football, food, family and beer. But Brett Decklever had a dilemma. Where could he watch the game in his adopted hometown of Sarasota? Restaurants were out, the limited drink selections and uncomfortable atmosphere was not what he was looking for. Also a conventional bar was not the place to take his three young daughters to cheer on his team. Lamenting his problems to a few friends over craft beers, an idea started to emerge. What if they could create a place that was suitable for a boys night, a date night, and a family dinner? 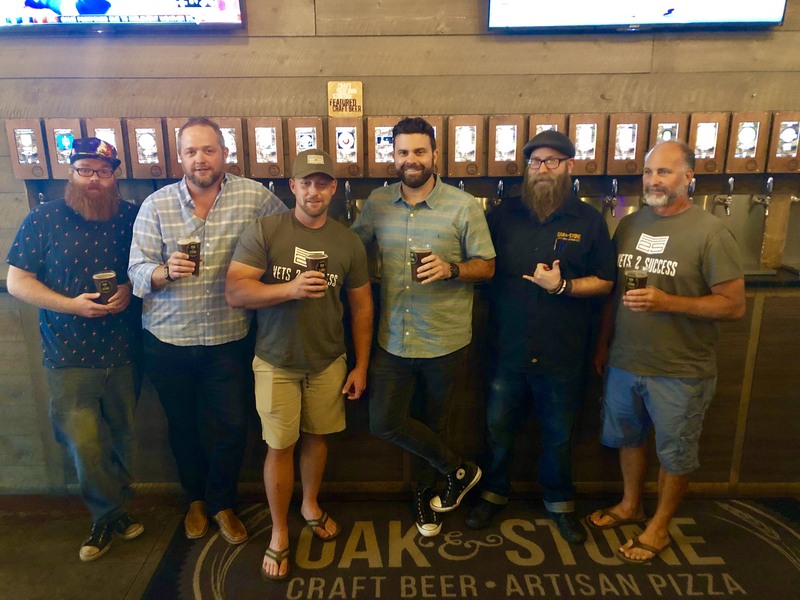 How could they take their love of local craft beer and turn it into an experience that aficionados would enjoy, without intimidating beer novices that just wanted a cold brew? And what goes better with beer than pizza? The friends knew they had a great idea. However, with a background in real estate, Brett understood he was hardly a restaurateur. Fortunately, he knew a guy. Enter Joe Seidensticker and Pat Seidensticker, co-owners of TableSeide Restaurant Group in Sarasota. With successful local establishments such as Libby's, Louies Modern and Muse, the partners knew they were the best choice to take Oak & Stone from concept to reality. Under TableSeide's expert operation, Oak & Stone was an immediate success. In tandem with TableSeide, the partners were able to create a warm and welcoming space for all ages, including open air kitchen, dining room, full bar, and a variety of seating options including an outside patio area. A billiards table, corn hole and large screen TV's with the latest sporting events all entertain customers while they dine. And dine they do. Artisanal wood-fired pizzas are handcrafted with dough that undergoes a 36 hour fermentation process with triple filtered water and topped with sauce that will keep you coming back for more. Whether you are partial to B.Y.O.P. (build your own pie) or selecting one of our many custom craft pizza. The standard tavern fare is elevated with options such as Smokey Gouda Mac n’ Cheese, Pretzel Crusted Tuna Sashimi, or the best bar snack in town Pork Crackling. Fresh offerings such as delicious salads and hummus plate round out the menu. And of course, there is the beer. Oak & Stone boast the largest RFID technology self-serve brew wall in the region, with 56 taps of golden beer goodness that you can pour by the ounce. Showcasing local and american craft breweries. Every restaurant has a story. Welcome to Oak & Stone. How will you craft your story?